Push-button hinge folds down for easy access. Strong safety straps eliminate gap between mattress and bed rail. Really pleased, fits nicely. Does the job well and for a good price. Excellent so far and very easy to install.we had to use the screws that came with it to keep it in place but happy with purchase. Arrived quickly, easy to assemble. 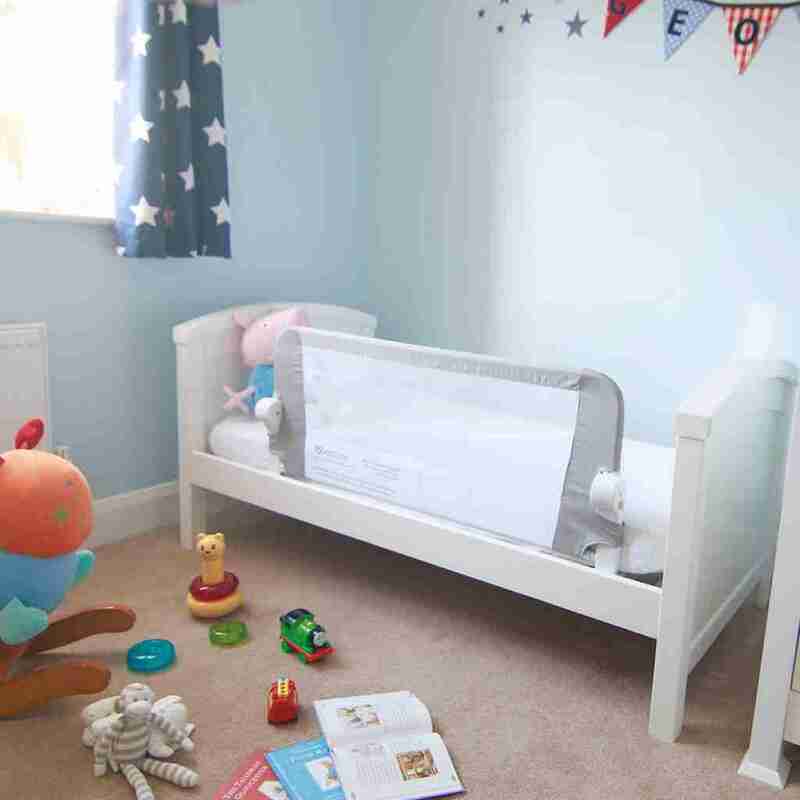 I have a cot bed and this size is perfect, it keeps my little one in his bed but if he wakes up he is able to easily and safely climb out through the side gaps. Would recommend. Great item, fixed to double bed and it’s fine. Strong and easy folding. We secured with cable ties as didn’t want to drill into bed. It’s a bit wobbly but does the trick. Looks great and keep my child safe. This has been great for my son – easy to put together and sturdy once done, and also easy to screw into the slats. It has stood the test of time well and is smart as well as useful in a toddler room. Really sturdy, easy to assemble and ideal for my toddler in a double bed. So happy I bought a second one to replace a well used Lindam one. Superb product. Delivered very quickly. So far so good. Can’t fault it. An all round good buy. Ideal product gor purpose,stops grandson falling/getting out of cot bed. Stong well made,value for money. Works as required. Nice and easy to use and a really great product so far – really pleased! Pretty straight forward to assemble and looks great. We really like this product and would recommend. This is such a crap product. Way too stiff and rigid. Really hard to use both hands to press buttons and fold down. And unless screwed the belts are not secure enough. And just realizing there’s no free return. I have to pay for its postage! So not happy!! Nice product. Reasonable price. Would recommend. Does the job it was designed to do. Was a bit hard to put together. Really well made. A little bit complicated to put together but feels solid and safe. Great value, easy to build and install. Could not be happier with this product, transitioning ur little one into there ‘big boy bed’ has been made so much easier, very sturdy which leaves me with peace of mind. It didn’t quite fit the slats on the toddler bed to screw into but that’s ok as it gives u another option to secure it! Like the design and it’s very sturdy.Found it extremely difficult to put it together. Took an hour to do and was very stressful. My husband had to cut a part down as we couldn’t put it together. Very disappointed about that. A really great bed guard. Fits well on a slatted single bed. Easy to assemble. Still a good height on a 25cm width mattress and good length coverage on a single bed. Useful and easy to use to fold down for an adult to get into the bed. Material is a good quality. This was bought in replacement of another we returned and can definitely recommend over the other we tried!!! Good service. Happy with the product. My son loves having it on his bed. Bed guard for a 2 yr old at grandparents house. Assembled quite easily and we ended up with the logos on the inside. Very secure and looks to have many fixings for alternative mattress and bed types. Easy to assemble and does what it’s required to do. A great product. Easy to use, sturdy and just what we needed. Good product. I think i’ll buy a second one because it’s easy to assemble and good quality products. Easy to assemble and fits nicely on the bed not too bulky. Like the way unfolds down at the top of the mattress rather than at the bottom like some makes. the net it came with was stitched so tight that we just could not get rod go through it to connect the other end! we thought of returning but couldnt get the rod out which was stuck half way through so had cut the pipe as last resort but still cudnt get it connected !so its just sitting under the bed with no use!waste of money for me! Good quality bed guard. Bit tricky to put together initially because the fabric is very tight. We used it in a caravan and worked really well. This product works great! It’s a bit fiddly to assemble (someone said it is easier if you do that while folded and it did work for us).However, one assembled it is very stable, or daughter leans on it all the time without issues!It comes with straps and can be screwed to the frame, but that is only necessary if the need slat is not recessed or the mattress is very thin. In our case we just put it under the mattress and has no problem whatsoever. A really good piece of kit, feels sturdy, and durable. Excellent bedguard. I am using on a single pine slatted bed and it screws down securely onto the bed slats and the matress sits perfectly on top. It folds down when not in use. Because it is fixed you can easily make the bed without any difficulty. Excellent bed guard and sturdy. As described! Really easy to use and great it folds down – many on the market don’t. Would definitely recommend. 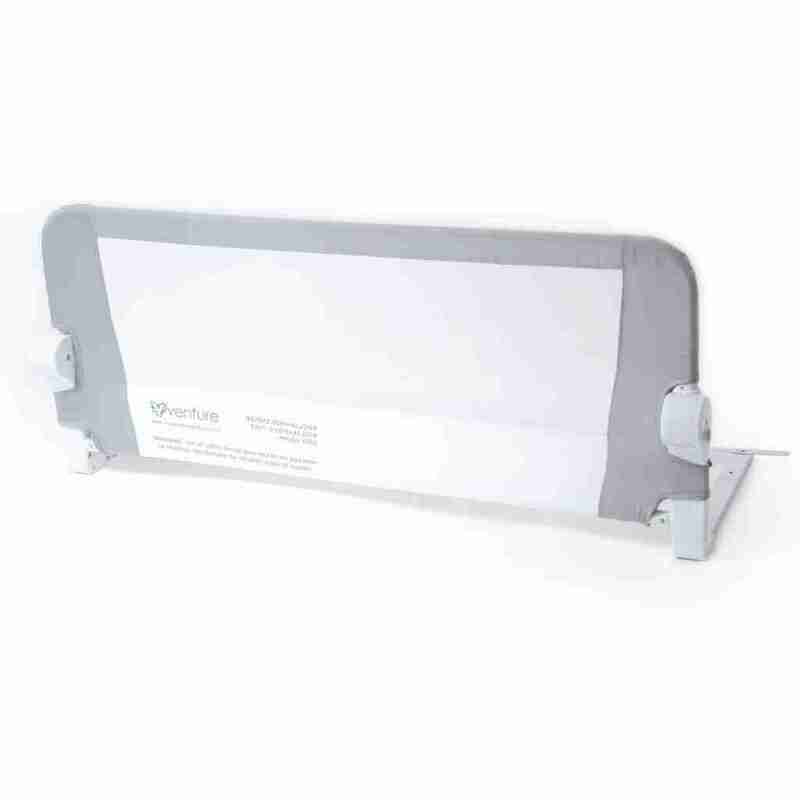 The product is great, the price was very reasonable and it was extremely easy to assemble. Would definitely recommend it to friends who are looking for similar products. Very strong and steady, great value for money. I would highly recommend this company to buy from. Very safe once fixed into place. My toddler tries to rattle it and it doesn’t get loose. Good quality item, not very easy to for netting on frame, but once done (don’t give up! ), it’s perfect! Easy to fit and does the job. Seriously, I’ve bought many bed guards. This is our fourth. Best quality, thus far. It folds at the right size, it even bends at a joint so it doesn’t snap when your kid decides to play push-pull with it, and it’s a gorgeous design.Minor details: People have complained about the writing being legible, but this is simply because they didn’t put it together without considering hiding it. You can certainly make sure the logo faces inward, so that it doesn’t show from the outside.Put this together in less than 15 minutes. Really fantastic product, highly recommend. Arrived quickly and very easy to assemble. Our two year old loves the security of it. Good strong bed guard which is easy to fold down. Perfect for my cot bed. As others have said it is a shame that the writing is on show. Mostly easy to put together except for the last section which is very difficult, you need to be very strong. This bed guard is really easy to assemble and stays in place even when my 2 year old pushes against it. Fitted to a Mamas and Papas cot bed. Easy to assemble. Just make sure you read the instructions. Rock solid screw fixing so it’s very unlikely to move out of place. Use your own screws as the provided ones are weak and I managed to strip the heads with a hand screwdriver. Although there are parts of the frame that lay directly under the mattress, they have a low profile and can’t be felt throught a cot bed mattress. Very happy with the product. looks great. We like a neutral color.Was easy to assemble and install on our child’s cot bed. Love it! It fits perfectly on the toddler cot bed, easy to assemble and the mesh means it’s breathable. I like that it folds over and we can have it down and it’s basically out the way. 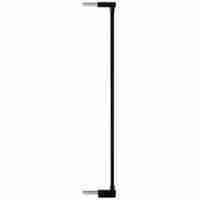 I like the grey and white colour of the guard and it is durable and functionable. The instructions are easy to follow, however the fit of the last piece is almost impossible. It is so tight I think I eventually forced it in after a good hour. The 2nd one I gave up until I built up my energy again. I still haven’t been successful. For this reason I have had to rate it down. I finally figured that the piece slots in easily once the guard is folded down! Excellent, so easy to put up and very sturdy , it’s brilliant. Great service too. Excellent quality bed guard. My child loves it as she is now in her big cot bed instead of the cot with sides. The guard folds down which means she can get into bed herself. We loved it so much we bought a second for stays at her grandparents. The cover could do with being very slightly bigger, difficult to fit with arthritic hands. It looks good when assembled. Really happy with my purchase .. a bit tricky with my daughter’s cot bed but it does the job. The only thing I don’t like is that it makes the mattress lopsided due to how much space it takes up on one side! Not a major issue but not ideal either. All bed guards might be the same though? 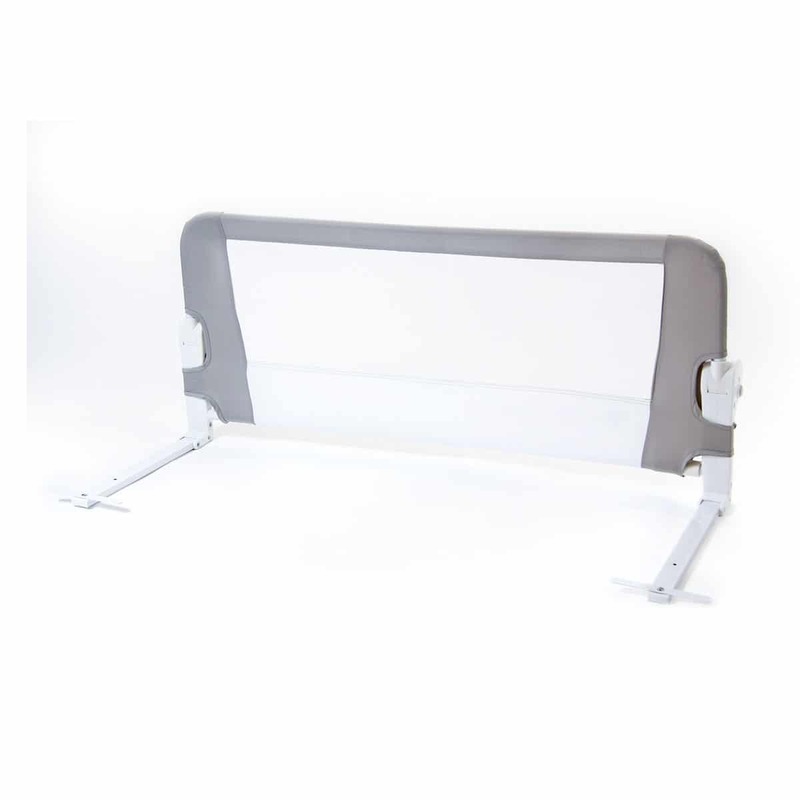 Used on a toddler bed (converted cot bed) so it’s only a thin mattress and it now can’t Layfield flat because of the bed guard.Aside from that it’s very easy to fold up and down, its sturdy and strong as its screwed into the bed slats – does its job. My toddler loves his ‘big boy’ bed. Fab! Folds all the way down – my daughter now loves jumping in and out of her cot bed! Tried to use the straps to attach, but wasn’t clear from instructions how to do this and ended up giving up, so won’t be using for travel. Found the metal bars could lie at an angle so we were able to screw onto the slats, so it is very secure. Very happy with the purchase overall. Lovely product and great price. I feel really reassured that my child is safe sleeping against this. Folds away nicely for the day time and is well made.The wood under my bed didnt quite measure right to fit the guard in as it should but i made do and it’s still very supported so im very happy and probably will buy another for the other side of the bed! This is an excellent item. Very good quality and the best thing is you can secure it PROPERLY to the bed. I had in the past the ones you can easily find on retail stores, I think Lindam is the brand, and the problem was it wasn’t securely attached to the bed, it was quite scary the thought of him falling with it. But with this one I’m very happy to feel comfortable to know that there’s no way that thing will easily fall.I have a metal bunk bed so needed this to adapt the lower bed to the little one. This worked perfectly on the metal frame.Gave 4 stars regards to the assembly, it’s not difficult but I followed the instructions and in the end, after attaching to the bed I realized that the side that folds down is on the way inside of the bed. My mistake probably. It is far from clear how to assemble this product – we’ve had several people look at it and have all given up. Furthermore the company hasn’t responded to our requests for assistance. Avoid. Really easy to put together, all done and installed in about 10 minutes. The Venture Q-Fix bed guard is fitted quickly and easily to the side of most beds. The extra wide and foldable bed rail is secured directly to the bed frame, providing superior stability and security. It’s suitable for almost any kind of bed whether it’s a single bed, double bed or cot bed with a wooden frame it can be fixed to it. Featuring an innovative folding hinge that can be operated with the simple push of a button. Once pressed the main panel can be folded down, giving your child easy access to their bed without needing to struggle. When they’re safely tucked in simply lift the bed gaurd into position until you hear a click! And that’s it your child can sleep soundly without being able to roll out of bed. The Venture Q-fix bed guard is not only fantastic at preventing your child from falling out of bed, it also does it in style! Some bed rails can be an eyesore due to clunky design and excessive metal parts on show. The Venture Q-fix uses a slim yet durable steel frame, with fabric materials and mesh so you get all of the strength of a bed guard without ruining the look of your sleek wooden bed frame.